I’ve had an up-and-down relationship with Row Jimmy. I really like the song, but there are times when it was almost a dirge and I tend to get bored with those versions. Fortunately, this is not one of them! I really like the arrangement in later years when there was a section with almost a reggae vibe. In fact, there is a reggae version of the song out there that is very good on one of the Fire On The Mountain releases. Judy Mowatt, who was one of Bob Marley’s backup singers, the I-Threes, takes on Row Jimmy for Volume 1 and They Love Each Other for Volume 2. Both are worth checking out if you like reggae (and both volumes are now sold together as well). My eldest son is named James and this song makes me think of him. I keep hoping he’ll take to it as he gets old. But for now James Taylor’s “Sweet Baby James” works a bit better. Solid Row Jimmys to check out? Any with the reggae vibe? Let me know in the comments. A lovely version of this song; laid back and mellow as per usual. 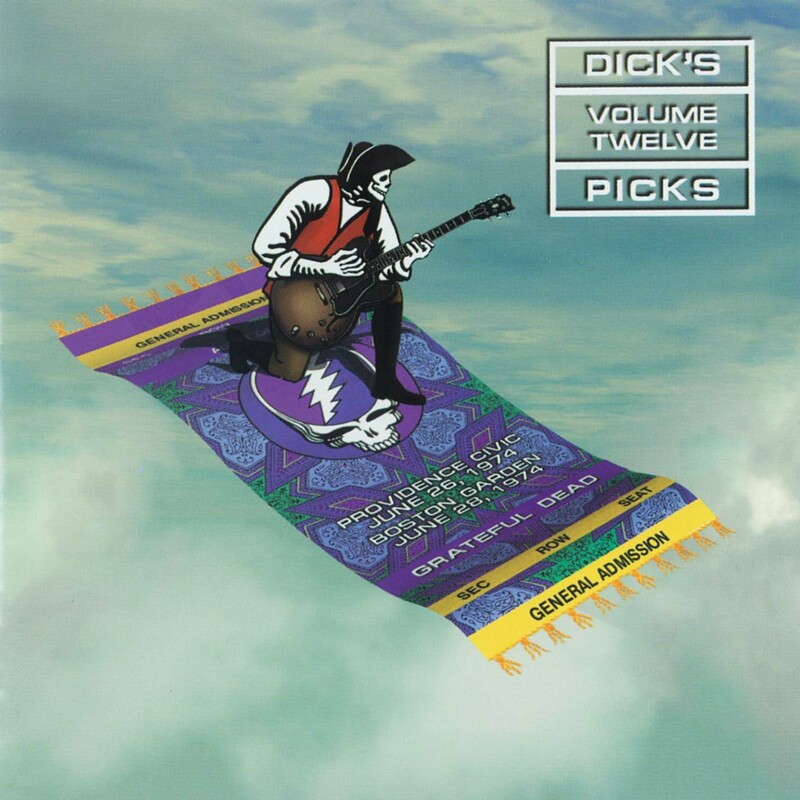 Garcia’s slide solo glides over the top of the song like an Olympic figure skating nailing a gold medal routine. The song structure is pretty straightforward but this isn’t your typical rhythmic sortee. The quasi-reggae feel generated by Bobby and the single drummer leaves a lot of room to play around and they add all kinds of off beat accents throughout. Donna sounds really nice on this one, as do the rest of the backing vocals. Yes, even Phil! This being a more mellow song it must have been easier to heard oneself on stage with that massive wall of sound. The chorus at about the 6:15 mark is basically a capella with the exception of some swirling keys from Keith. Toward the end the rest of the band jumps back in and continue with another round of the chorus. A few final exhortations for young James to get down and row leaves the crowd roaring for more as the song ends. Tagged 1970s, 1974, Boston MA, DP12. Bookmark the permalink. hell, shout out to Love In The Afternoon as well!! …i&i LOVE ALL the reggaesque tunes! Thanks Ace. I believe you had touted Row Jimmy in this pages, which inspired me to take another look. An old friend suggested this one to me and I agreed with his assessment. Another spankin’ new one from their current album finds the Dead on top of it. “Julie catch a rabbit” – hey, wait a minute, Julie must have been a dog! I just got that, finally. Crazy. This one sounds spiffy, except for, yes, I have to say it again, those so-called harmonies sung by Donna Godchaux. Billy pulls off a funny, extended roll twice during the following solo, seemingly trying to trip the boys up. It doesn’t, though. Jerry maintains focus and delivers verse two just right. The next chorus is better right up until the end of it. Then here comes Jer again with the slide. He is not totally confident in this role, but does pretty well anyway. Another verse slides by in style and we are back to sucking on the chorus. She almost had it before! What happened? The bridge is iffy at best, too. From here it is kind of embarrassing for the most part. Garcia tries to sing over Donna and I figure he was ready to run over her by this point, too. Yuck!